Marmite is a savoury food spread made from yeast that can also be used to flavour stews etc. In 1902 the Marmite Food Company (later Marmite Ltd) was set up by the Gilmour family in Burton on Trent, Staffordshire. It's mission to produce a concentrated savoury spread from beer! The basic raw material used in the manufacture of MARMITE is spent brewer's yeast, a substance whose original and only use was to ferment sugars into alcohol. For many years this by-product of the brewing process was seen as a nuisance rather than potentially valuable food source. Justus von Liebig, a German scientist, had found a method to extract a palatable paste from the spent yeast. The Gilmours sought to turn this into a business. The popularity of Marmite was boosted when Vitamins were discovered by William Fletcher. Yeast was discovered to be a great source of five important 'B' vitamins. 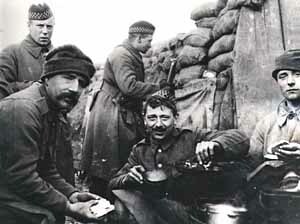 As a result Marmite was included in soldiers' ration packs during World War I. It became a dietary supplement in prisoner-of-war camps in World War II and was sent to British peacekeeping forces in Kosovo to boost morale in 1999. Marmite originally came in a small earthenware pot, similar to the kind of French casserole dish called a 'Marmite', (pronounced MAR-MEET). This may be where Marmite gets its name from. Because of the strong taste of Marmite many people think it is a meat extract, Marmite is '100% meat and fat free' so it is suitable for vegetarians. If you know a fussy person who says 'Oh no, I can't stand Marmite' offer them a 'Twiglet', most people quite happily eat a Twiglet even though they are coated in a yeast extract (not a lot of people know that). There are now many imitators but Marmite is the original. HP Sauce was invented in England at the end of the 19th century by Mr FG Garton, a Nottingham grocer. He was down on his luck and couldn't pay his bills, so when Edwin Samson Moore, owner of the Midland Vinegar Company, offered to cancel his debt with the company and pay him £150 for the recipe, plus the use of the name HP, Garton jumped at the chance. Moore had been looking around for some time for a sauce to manufacture and market. He liked both the taste and the name of Garton's HP Sauce, which had an appropriately patriotic ring to it. The HP stood for Houses of Parliament, as it was rumoured that the sauce had been seen gracing the tables of one of the dining rooms there.